Is there a difference between a pashmina and other types of shawls or scarves? Yes! The word "pashmina" refers specifically a type of very fine cashmere made from goat's hair in the Himalayas. As this type of soft shawl became popular, similar versions have become popular, too. These versions often share traits such as a wide, long rectangle shape (wider than most neck scarves), colorful prints, and tassel edges. And while the material is often thin and soft, other scarves are not always made of this specific cashmere. Whether you are wearing a true pashmina scarf or a similar style, there are several different ways you can wear and use them! Below are a few suggestions to get you started. You can drape, wrap, and wear a pashmina shawl in many ways. The options are nearly endless! One of the easiest and trendiest ways to wear and tie a pashmina scarf is to loop it. This keeps the scarf in place on windy days or during busy activities, but also easy to take on and off without complicated knots or bows. It also shortens the scarf a bit so it's not dangling down too far. Start by folding the scarf in half width wise. You'll have one end of scarf with both tassel ends, and one with a fold. Wrap the scarf behind your neck and place. In one hand, separate the scarf to form a hole on the side with the fold. Insert the tassel ends through the "loop" you've made. Pull the tassel ends through until the folded edge is snug, up under your chin to your desired tightness. Pair a trendsetting blazer or lightweight coat with this look for a fashionable outfit option! Pashmina scarves are a wonderful item to wear over a casual cocktail dress or an evening gown. They make it easy to bring a layer of warmth to wrap around your shoulders and arms without having to wear a jacket, cardigan, or blazer. And because pashminas are readily available in a wide array of dazzling colors, you can find one to match your outfit and really make it part of the look. One thing to keep in mind, however, is a pashmina will only allow for moderate warmth and outdoor weddings on cool days could be chilly. So take the weather report into account first. Come the reception, however, you'll be dancing and leaving the pashmina at the table while you're out on the dance floor! Because of its simple rectangle shape, and wider width than a typical scarf, a pashmina works great as a lightweight throw. Keep one on hand for the first nights of Fall or an early Spring morning near your outdoor patio. You can even color coordinate a few with your patio furniture or backyard style and have them on hand when having company over. Or use it cover your legs in a cold movie theater, just like you might use a blanket on the couch at home. You can even use it as a throw on an airplane, where the air is typically chilly on long flights. Once you're done, you can wrap it around your neck or tuck it away with ease. Much easier than carrying a bulky blanket! 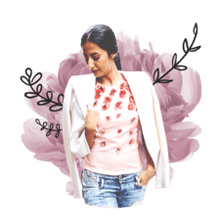 If you're into a minimalist look or have created a capsule wardrobe, you may be looking for simple ways to add color, texture, and flair to your basic outfits. Wearing a colorful pashmina makes it easy to change it up! Drape one in a bold color of fun print around your neck to spice up a classic outfit combination like blue jeans and a white shirt. It's that extra touch that makes any typical outfit more fun and stylish! In colder months, try a chic way to wear a pashmina scarf as a top. Wrap the scarf around your front and bring the back over the shoulder toward the front to let it drape. This covers the entire torso and can create the illusion of the scarf being a top or sweater. In warmer months, you can wrap the entire pashmina around your torso and tie behind your back. Gather it up or let it hang long, either way it's a casual and daring look. Try it over a bathing suit for a little coverage or be bold and wear it out on the town with a skirt or jeans and some high heeled shoes.